Today I’m going to write about one how to make a healthy smoothie recipes with spinach, of my favorite vegetables. I’ve always love spinach. My love for it grew when I was a kid watching Popeye on the TV. Popeye was always in trouble but luckily, he has a can of spinach with him. Just by eating the spinach, Popeye become super strong and can solve any problems in front of him. Now I know it’s just a fiction, and people can’t get super strong just by eating spinach (you have to lift weights to be strong by the way). But it’s a cool way to coax a little kid to eat his vegetables. Another reason why I love spinach is because of its bland taste. It’s very different than other vegetables that are bitter. Fast forward to today, I now know that spinach is one of the most nutrient dense fruit with lots of benefits and our love affair grows stronger than ever. What Nutrient And How Much Of Them Does Spinach Has? There are dozens of nutrients in spinach but I only listed the 10 most abundant nutrient of it in the list above. The nutrients above are listed based on 1 cup (180 g) of spinach and according to their percentage of Recommended Dietary Allowances (RDA) taken from here . As one of the most nutrient dense vegetables, the health benefits of spinach is very large. It is rich in Vitamin K, A, B2, B6, E, C and B1. It also contain lots of minerals such as manganese, folate, magnesium, iron, copper, calcium and potassium. Not only that, it is also high in fiber. One of the things that make spinach really stands out is the huge amount of phytonutrients (minerals in plants) that have anti-inflammatory, anti-cancer and anti-oxidant effects. This is a normal occurrence in leafy green vegetables . Their vibrant green color can house lots of phytonutrients that are very beneficial to our body. The nutrients in spinach can help with reducing high cholesterol level and also high blood pressure. This in turn will avoid a myriad of diseases such as heart attack, stroke and many more. Anti-oxidant in it can also protect brain cells from oxidization damage. It will help to increase our brain health and prevent declining mental faculty such as forgetfulness, loss of problem solving ability, Alzheimer and other symptoms typically associated with older folks. Another great thing that I want to point out is the huge amount of Vitamin K in spinach. In one cup (180 grams) of spinach, we can get up to 800 mcg of Vitamin K, 8 times the recommend daily amount of it! Famous for helping with blood clotting, this vitamin also has another usage: helping increase bone health by preventing activation of cells that break down bone. Due to this, it is very helpful in preventing osteoporosis (for those that didn’t know, osteoporosis is the decreased bone strength which is very susceptible to happen with menopause women). The usual weapon against osteoporosis is calcium (milk) and Vitamin D(exposure to sunlight). Vitamin K in spinach will be able to help preventing osteoporosis. 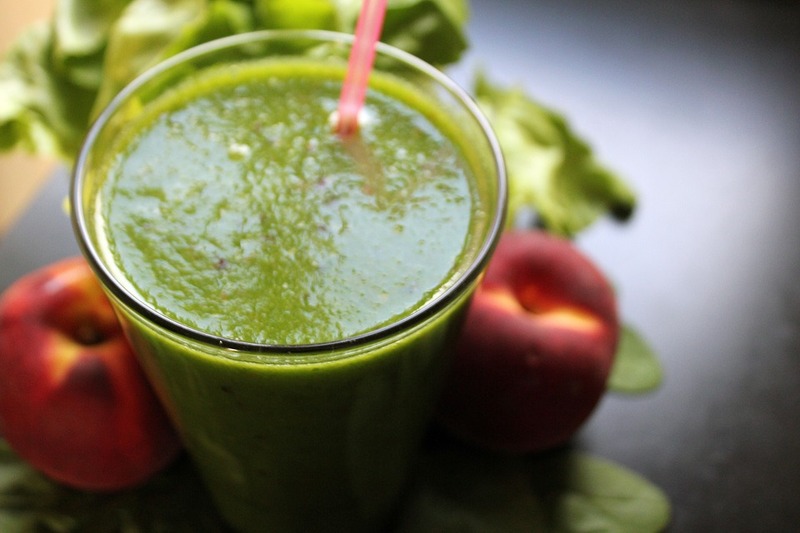 Now, let’s move on to how to make healthy smoothie recipes with spinach as its ingredient. I have chosen 3 delicious recipes to share with all of you. All recipes listed below belongs to allrecipes.com, my favorite recipe site. They have lots of recipes submitted from users to be tried. I always go here to find some new ideas for cooking. Unfortunately I can’t post any photos from the site. But I’ve added the link to allrecipes.com at the recipes’ title if you want to check out the recipes photos. Now let’s get on to it. A basic spinach and banana smoothie, which is my favorite! The banana and soy milk (you can use any milk btw) will give the sweetness to the otherwise bland spinach. Put all ingredients into a blender and blend thoroughly. You can also add some ice to make the smoothie cold and refreshing. A step up from the recipe above. Introducing kale, a contender for the title of the king of leafy green vegetables! Some people say kale is better than spinach, some people say otherwise. This recipe just take both of them and create one super healthy smoothie out of them. Chia seeds is optional in this recipe. If you want to put it in, my recommendation is to put it separately, i.e not blend it together with the smoothie. Just put it in the finished smoothie and stir. Drinking the smoothie with the seeds intact will add more texture to the smoothie which I really love. Put all ingredients into a blender and blend thoroughly. You can also add some ice to make the smoothie cold and refreshing. Chia seeds to be put into the finished smoothie and stir. Wait for 15-20 minutes to let the seeds to absorb the moisture. You might need to add more water at this point to replace the absorbed water. Hala kahiki means pineapple in Hawaii. 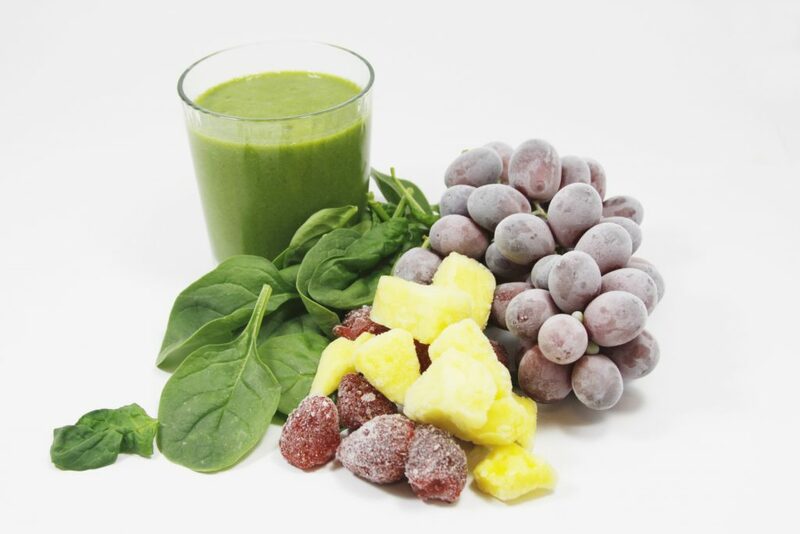 Its a very refreshing smoothie will all the Vitamin C rich fruits and not to forget, our spinach. The original recipe calls for flax seed, but I think chia seed is much better (you also do not need to ground it, unlike flax seed). Put all ingredients into a blender and blend thoroughly. An alternative is to freeze the fruits beforehand. That way, there is no need to use ice in your smoothie. I hope you enjoy the healthy spinach smoothies. I would like to remind that not all blender can thoroughly pulverize spinach. 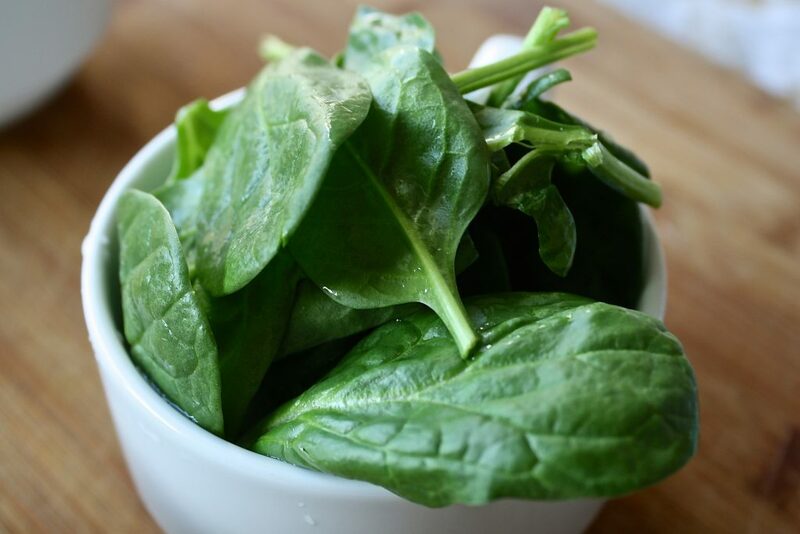 Like other leafy green vegetables, spinach has a hard cellulose walls that is harder to be cut compared to fruits, and you will only get lumps of greens which is not good to drink at all (trust me, I’ve done that..). Because of this, I recommend you guys to buy a high performance blender to make your smoothie. You can see some of my reviewed blender at the menus on top of the site which are great for your usage. Some of my favorite blenders are the Vitamix Professional Series 750, Breville Boss and Blendtec Designer 625. Drop your comments on the form below to share your results of making these smoothies. Till next time. Cheers! Next Post: Nutribullet Rx Review – The Best Personal Blender Ever? So first off I went and tried the spinach banana. Very good! I really enjoyed it. I liked the article really informative, and I got a lot out of it. Who would of thought that spinach would be so good. And I learned a new word. phytonutrients. So thank you for a delicious breakfast or at least part of one, and an added word to my vocabulary! Hi Josh! Thanks for reading and I’m glad you like it. Spinach truly is a wonderful vegetables that I would totally recommend to anyone looking to improve their health. Spinach in a smoothie is definitely the right move as spinach has so many different nutrients that help our bodies out. I like the fact that I can get a lot of spinach down in one sitting because it blends very well and compacts nicely. Haha it’s not very tasty so to mask the taste I usually add some citrus and sweet fruits like oranges and pineapple. I totally agree with you Will. The high nutrient content in Spinach is also one of the main reason why I love it so much till it become my favorite smoothie ingredient. Same like you, I also put some fruits to mask the vegetable taste. Cheers! I definitely need to eat more spinach. But I hate it. I just don’t like the taste, how it feels in my mouth. But I’m open minded. I’ll try out some of your smoothies and see how it goes. For me the banana/spinach smoothie looks like the best one. I’ll come back and let you know. Hi Dave. Actually I find that soaking spinach in hot water for a few minutes will really make it mellow, tender and don’t have that much taste. A spinach smoothie on the other hand will definitely have more of that spinach taste. This was a very timely article for me to read because right now I’m actually drinking a smoothie that has spinach in it! There’s great information on here and it’s good to be reminded of how healthy spinach really is. I love how your second recipe includes 1 tablespoon of peanut butter. I’ll have to try out this recipe! Hi Elsa. Great to know that you love spinach too. Hope the recipe turn out great for you.